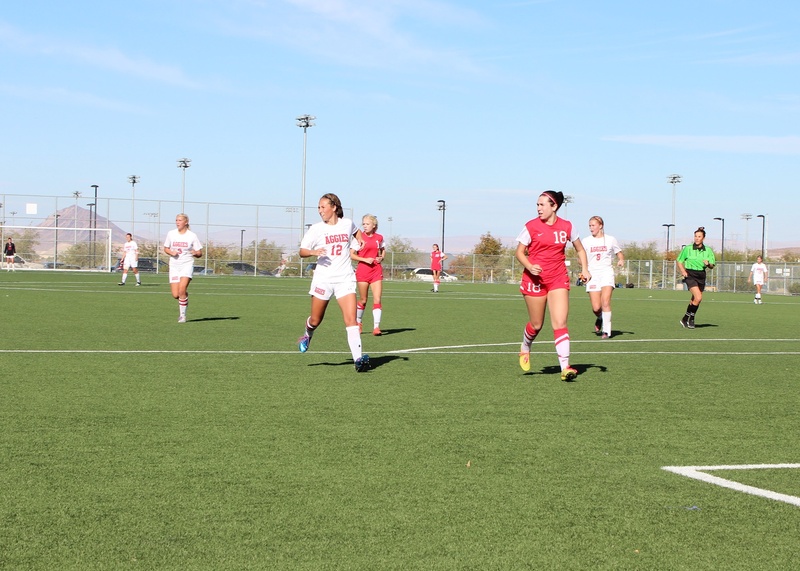 Arbor View’s Haley Vicente (12) overcame two ACL tears in both knees to shine for the Aggies in her senior season. Those were the sentiments of Arbor View coach Jay Howard after his Aggies won their third straight girls soccer state championship Saturday, with a 6-0 win over Coronado. A valiant team effort, after a dominating run through the postseason, but for one player it was a title that was long overdue, and that easily wrapped up what should be considered the comeback story of the year. Howard was referring to senior Haley Vicente, a dynamo forward with cat-like quickness and shocking agility considering what she’s overcome. Put it this way, if this were a story about a women’s national team, or some NCAA squad that had a feel-good ending, we’d see it on ESPN with veteran reporter Tom Rinaldi narrating it with that slow, sappy music playing in the background. You know, the ones that have even the biggest and strongest of men reaching for tissue paper to dry their eyes, because it’s too touching not to tear up about? See, while Vicente has been a part of the varsity program her entire high-school career, she only played for the Aggies during her freshman and senior seasons. In between, she watched on crutches, with torn anterior cruciate ligaments. That’s not a typo; that’s plural. After tearing her right ACL her sophomore campaign, and then being cleared to play during the offseason, she tore her left ACL two months into her club season. It takes quite an athlete to overcome one torn ACL, so you can imagine how big a deal it is to see someone recover from two, and then lead a team to a championship title. It’s even more special when all that person wants to do is deflect praise, and shower her teammates with all the glory. 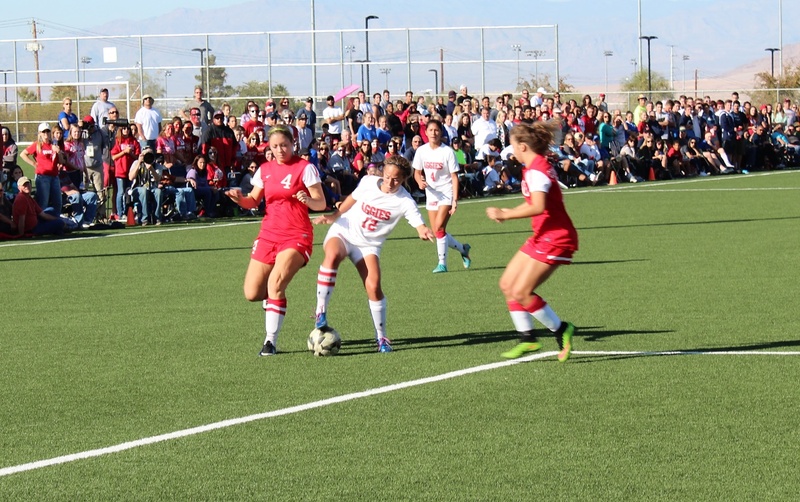 Haley Vicente scored 11 goals and had 3 assists in the postseason to lead Arbor View offensively. Vicente, who recorded three hat tricks during the playoffs, opened the scoring in Saturday’s state championship by giving Arbor a 1-0 lead in the 18th minute of the first half. The goal got the motivation flowing, and sparked her teammates to feed off that momentum, including her younger sister, Sierra, who promptly gave the Aggies a 2-0 lead with their second goal of the game, in the 25th minute of the first half. “It was so amazing, it was so cool, I love playing with her and it’s really been an honor to play with her,” Haley Vicente said about seeing her freshman sister score in the title game. It’s been a long ascension back to the field for Vicente, and both her mother and father – Margie and Gary – say they’re personally inspired by their daughter’s indomitable spirit, and drive to return to the field for the Aggies. 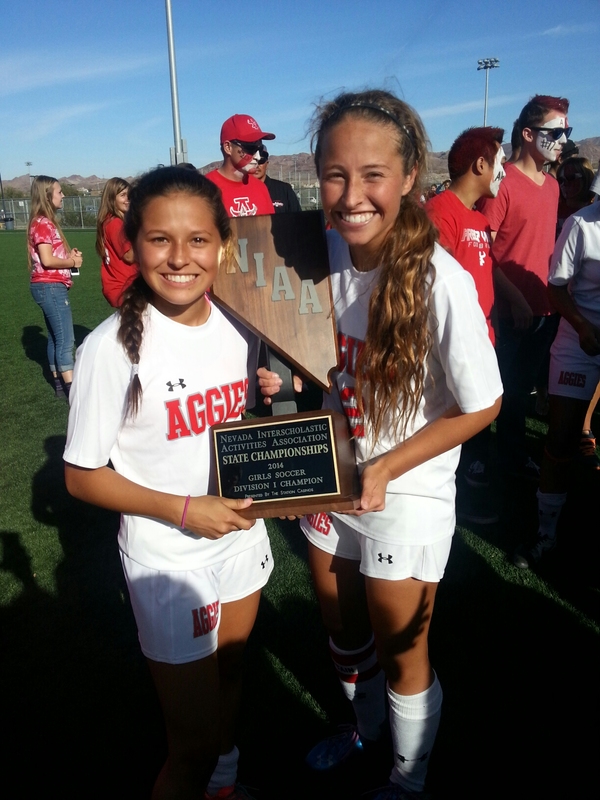 Arbor View sisters Sierra and Haley Vicente pose with the state championship trophy. Each scored a goal in the title game. Gary Vicente said his eldest daughter, who is verbally committed to Cal State Bakersfield, provides inspiration to him daily after overcoming her injuries and performing the way she has during her final high school season. That’s not news to her club coach, Robert Andrade, who has coached Vicente since she was 6 years old. Andrade, who heads the ECNL Las Vegas Premier team, said what’s always impressed him has been Vicente’s work ethic off the field. Whether it was rehabilitation, personal training, going to the gym and then following one of those by showing up at practice, he says he never saw her break down to the point she wanted to give in. On the contrary, every obstacle provided motivation. And it finally paid off. After watching the Aggies win the state title the past two years, she was able to celebrate with her teammates thanks to the effort she put in while participating and contributing in the games. She certainly got that experience, feel-good story and all. And even if ESPN and Rinaldi weren’t there to narrate her tale and tell their viewers about her, there were plenty of tears at Heritage Park for what is easily the comeback story of the year.